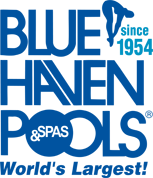 Since our original post about cascade water features, Blue Haven Pool offices across the nation have seen this pool design feature continue to grow in popularity. There’s a good reason why: Cascade waterfalls are inherently flexible for design. They provide a contemporary aesthetic that’s attractive to those who prefer modern style with a look that also adapts to rustic, tropical, or other natural-style pool designs. They also enhance your backyard ambiance with the sound of gently moving water. To illustrate the distinctive look and feel of cascade features as a pool accent, we’ve added some photos below. These images help show the many options available for your new or remodeled pool. 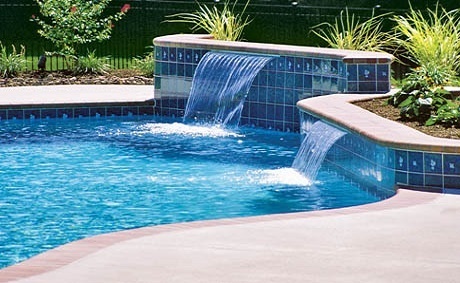 Staggered cascade waterfalls at the pool edge offer a stepstone variation for visual interest. These waterfalls project out from a raised, staggered wall, adding flair and increasing the sound and movement of the water. A single cascade feature makes a big statement when it’s backed by a stand-alone structure like this stone- and tiled-covered wall. 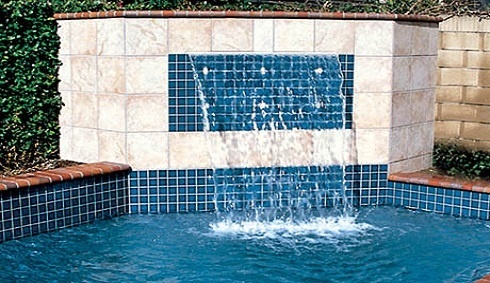 Cascade waterfalls can be placed throughout your swimming pool in a variety of heights and configurations. 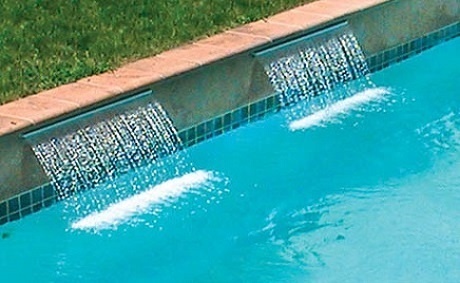 This single-level, streamlined row of droplet cascade waterfalls is a great way to add drama to any pool. This raised beam wall with copper scuppers and Arizona Moss flagstone gives an earthy appeal to these individual streaming cascades. Back lighting on this elevated droplet cascade makes for a stunning nighttime display. These dual rows of droplet cascades project out from a raised pool edge for a playful display of beaded water. A sleek alternative to droplet-style waterfalls, these two sheet-like cascades are more spaced out, but equally eye-catching. 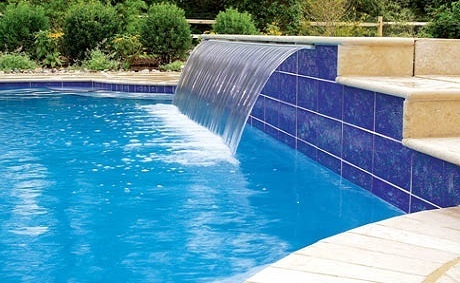 Because it enhances both the sights and sounds of a swimming pool, one of today’s biggest design trends in backyard resorts is a type of waterfall known as a cascade feature. One kind of cascade comes from a specially designed overflow from an attached spa. 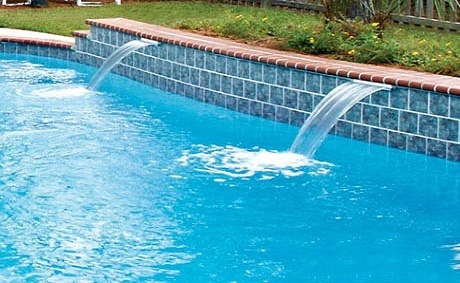 However, an independent cascade feature is possible in any pool with a raised section of wall or other structure—no spa required. The stand-alone feature comes as a manufactured vessel. 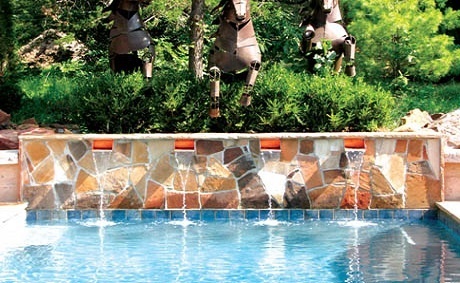 Available in several models, straight and arched, it can be installed on either straight or curved pool walls. Another model option is the pattern of water flow. The original style flows as a sleek, smooth sheet. A newer style has the water falling in broken drops to mimic the look of rain. 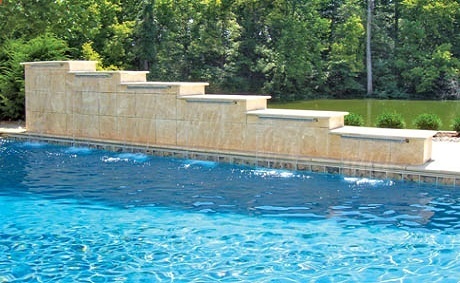 Elevated above the surface of the water, these features are typically built into a section of pool wall known as raised bondbeam that extends 12” or higher than the waterline. A favorite approach is to build the bondbeam as a distinct structure and shape—often with a special tile design or stone facing. 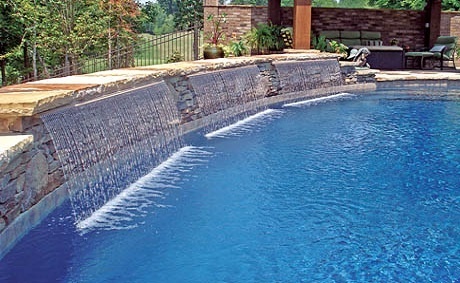 The free-standing structure brings additional dimension to the poolscape while showcasing one or more cascade features. The feature can also be integrated into other structures that sit high along the pool perimeter, such as a bridge, planter, or pot-style vessel. 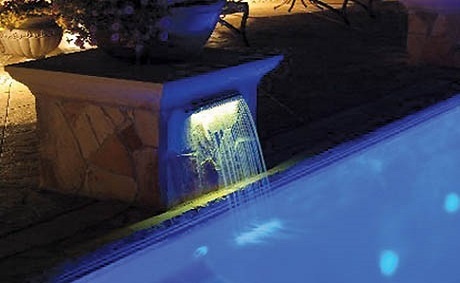 From its high position, the cascade feature delivers a continuous sheet of water—one-foot or wider—that falls into the pool surface below. For greater drama, standard cascades are available up to six-feet wide. Another way to achieve a wider cascade span is to use multiple features in a row of two, three, or more. They can be installed directly next to one another—creating a single span that is several feet wide or longer. A related approach is to create a series of cascades. Each feature is installed with some space—commonly 6” to 24”—left open in between to spread them out in an array. To create greater visual interest, they can also be placed at various or alternating heights. Do keep in mind that based on the size and number of cascade features, a greater volume of water will need to be circulated. Therefore, your builder may recommend that your pool plan include a larger pump and/or a booster pump. 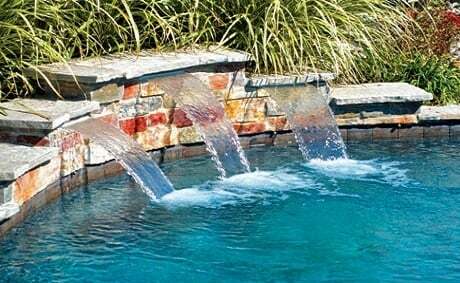 Whichever style, quantity, and placement of cascades chosen, you will be sure to enjoy how the moving water glistens in the sun. You will also enjoy hearing the accompanying relaxing sounds. If you would like the maximum “wow” factor, be sure to have your builder light your cascade features. By including a color-changing LED system, your illuminated cascades will provide many evenings of dazzling scenery.